I wanted to get your opinion on which dual action polisher to buy. I don't detail professionally. However, I do own a 33 foot boat that I detail annually and I enjoy keeping it looking its best. I currently have a Makita 9227c, but no DA polisher. My typical annual routine is a two step process. First step is with the Makita 9227c and a one step compound/polish to remove any light oxidation and bring back the shine. The second step is to apply a coat of Marine 31 Gel Coat Carnauba Wax + Sealant by hand. This process works well, but the rotary machine is probably more than I really need for annual cleanup and it also leaves behind holograms in the gel coat that can be seen at some angles. I'd like to switch to a DA polisher. I did buy your detailing book and I know you speak highly of the Flex XC3401. However, I've also been looking at the long stoke DA polishers like the Griot's Boss G15 and G21 and the Rupe's LHR 15ES and 21ES. Then again, maybe these machines are overkill for the limited use they will be seeing and just a basic Porter Cable 7424xp would do the job fine. I don't mind spending the extra money for the higher end polisher if it will give me better results and make the job easier. I just want to buy the right tool for the job. I look forward to hearing your opinion. Sorry for the late reply, I left for Oregon on December 2nd for a vacation and did not return to work until today, (as I type this it' 8:20am December 12). Hang tight and I'll answer your question. I wanted to get your opinion on which dual action polisher to buy. I don't detail professionally. However, I do own a 33 foot boat that I detail annually and I enjoy keeping it looking its best. I currently have a Makita 9227c, but no DA polisher. I did buy your detailing book and I know you speak highly of the Flex XC3401. However, I've also been looking at the long stoke DA polishers like the Griot's Boss G15 and G21 and the Rupe's LHR 15ES and 21ES. Then again, maybe these machines are overkill for the limited use they will be seeing and just a basic Porter Cable 7424xp would do the job fine. I don't mind spending the extra money for the higher end polisher if it will give me better results and make the job easier. I just want to buy the right tool for the job. Great question. I'm glad you asked it because my guess is there are a lot of guys just like you, that is they own a boat and a rotary buffer but not a dual action polisher. They want to purchase a dual action polisher but they're not sure which polisher to go with? While budget is a factor, anyone that owns a boat also has worked hard enough in their life to know the value of doing a job right the first time and in this context doing the job right the first time means doing their research and then making the right purchase the first time. My recommendations are go with either the FLEX 3401 or the Griot's 6" DA Random Orbital Polisher. I'll explain why below in detail in two separate posts to make reading my reasoning easier to read. 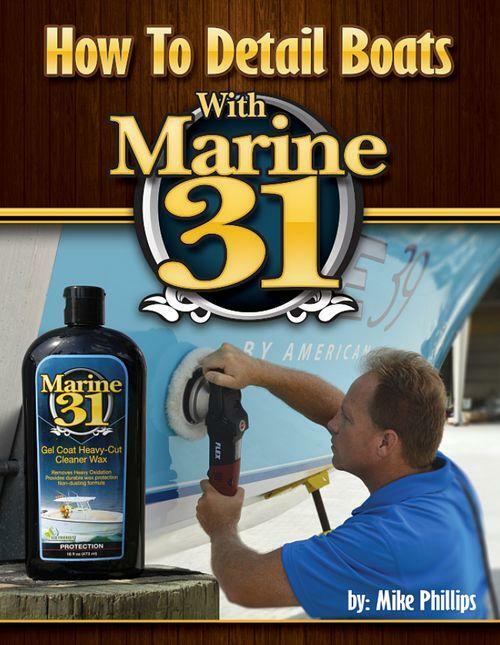 First - Thank you for your trust in me and purchasing my boat detailing how-to book. Without a doubt, out of the 5 how-to books I've written the boat detailing book was the most difficult because I cover the most topics and the most tools in-depth. I even cover how to do major oxidation removal using a 4-step process by hand and I think it's the first time in my life I've ever seen the hand compound, polishing and waxing process explained in detail. So thank you for your purchase and I hope you enjoy the book. Sorry for the delay again.... so buys playing catch-up after being off for one week. Same goes for any pictures on a book cover. Thus, I tried to convey a message without words by showing the FLEX 3401 being used on the cover of my first boat detailing book. This was very much on purpose. Generally speaking - boats are BIG. Sure some people own small boats but even a small boat has a LOT of surface are to be addressed. The FLEX 3401 is a BEAST! And the reason why is because it truly is a beast. The reason why is because it's the ONLY gear driven orbital polisher on the market and because it's gear driven the pad will NOT stop rotating or oscillating no matter the shape of the shape, size or curve of the panel. All the other free spinning orbital polishers cannot make this claim. In fact with ALL the free spinning tools you must spend your time focusing on how you hold the tool and the relationship between the face of the pad and the angle of contact between the surface being compounded or polished instead of simply running the buffer. What that means is due to the gear driven nature of the Beast you can buff as fast as humanly possible getting the job done as fast as possible while still maintaining professional quality results. Any orbital polisher will work and get the job done on flat surfaces and of course the sides of a boat hull are large flat or slightly curved surfaces. But when you get to the top cap where you have a lot of shapes and curves and components protruding out of the hull the FLEX 3401 excels. In my book I strongly recommend the FLEX 3401 to ANYONE that does' production work because with the FLEX 3401 you slap a wool cutting pad like you see me using on the cover of my how-to book and then with a one-step cleaner/wax you can power through a boat detailing project with ONE STEP. That's the idea, that's the goal of doing production detailing. When the spinning wool pad accidentally hits a steel cleat or any other component on a boat hull you'll see a little tuft of wool go flying and NO BIG DEAL you keep on powering through the detail job. With a foam pad, the foam will rip. Ouch. Been there, done that. A wool pad on a FLEX 3401 is the fastest way to buff out a boat and maintain pro grade results. This is also true for the fastest way to restore a neglected boat as long as it's not to far gone. Of course, anyone that owns and has read my book knows I explain all of this in the book. So for doing production work or for maintain a boat already in good to great condition you cannot beat the power and speed of the FLEX 3401. I love rotary buffers. I'm the only guy I know that actually has his original rotary buffer. The buffer I started out with when I started detailing cars. It's in my office in my antique wax display case. So I love the rotary buffer and I fed myself with my personal rotary buffer for years. It no longer works as the gears wore out. The above article by the way is the ONLY article like it in the boat detailing industry stating the problem and the solution. Anyway, just like in the car detailing world, while it can be appropriate to start with a rotary buffer it's safer to finish out with an orbital, any orbital. The reason why is in most cases, using a quality orbital polisher with a quality pad and a quality product, the orbital action of an orbital polisher will remove the holograms left by the rotary buffer resulting in a more perfectly flat, high gloss surface. Out of all the tools in our industry the rotary buffer takes the most muscle, throughout the human body to control and work over a surface. This means it is the tool that will tire you out the fastest. I would say the FLEX 3401 is next in line as far as fatiguing muscle and that's due to the gear driven power of the tool. Just want to be honest and forthright with anyone reading this into the future. For the hobbyist, the FLEX is the fastest way to buff out a boat in categories #1 and #2 as shared in my how-to book. In the first paragraph of the chapter on how to restore boats in category #3 I state the rotary buffer is the best and fastest way to remove oxidation but boats in category #3 can be restored using the FLEX 3401 and other frees spinning orbital polishers but the trade-off will always be speed or time needed. So for you Rick, if your boat is in category #1 or #2 and you already own a rotary buffer than you can get a way with either the FLEX 3401 or the Griot's 6" DA. If you want speed then go with the FLEX 3401. If time is not a factor and you want a tool that is easier on you physically, then go with the Griot's 6" DA polisher. For severe oxidation cut first with the rotary and finish out with either type of dual action polisher. For boats in new or like new condition, or with light oxidation skip the rotary and go right to either orbital. If you have more questions about either tool please ask.